We have many models available with a built in 48 hour timers. This time will allow operation from 1 second to 24 hours. Shock treatments need to shut the ozone off before entering the area. great functions - easy to use. 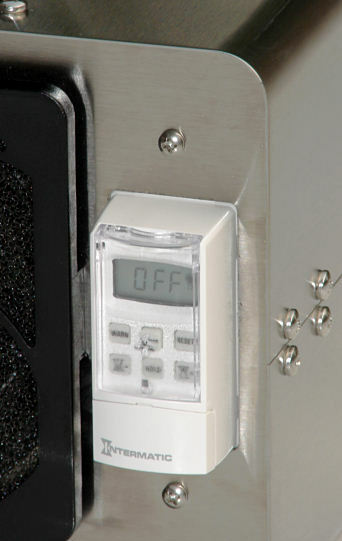 The UV PRO 2800, and UV PRO 4000 come standard with a built in 48 hour timer. The PRO 3600 V1, PRO 3600 V3, PRO 3600 V4, PRO 3600 V5, PRO 5,000 V, and PRO 9,000 are available with, or without a timer. Many competitor timers do not go past 2 hours, or go for even less time than this! For most shock treatment needs, and for professionals in the business of fire restoration, flood restoration, and mold redemption, these timers would not be used as more time is usually needed for larger tasks or thorough bacteria, virus, and mold killing. Ozone is built up in concentration in much the same manner in which it is depleted, however, when performing shock treatments, the first couple 30 minute intervals or so will actually build the ozone concentration slower than the subsequent 30 minute periods. This is because the ozone reacts or depletes much more rapidly in the presence of contaminants, such as smoke, mold, bacteria, chemicals, and other impurities. Larger concentrations of ozone can be achieved over several hours to days if needed for heavily contaminated areas. Ozone is depleted much more rapidly in high temperatures, than in low temperatures. At COLD temperatures, such as freezing, ozone may not be depleted for over 30 Days. It is important to use ozone in temperatures above 60 degrees Fahrenheit. Do aggressive competitor statements have you concerned about anything? Read our Informed Decision page for answers and resolution of many issues. 24 hour - one shot programmable timer pictured; has now been replaced with a new upgraded 48Hr timer standard on many models.